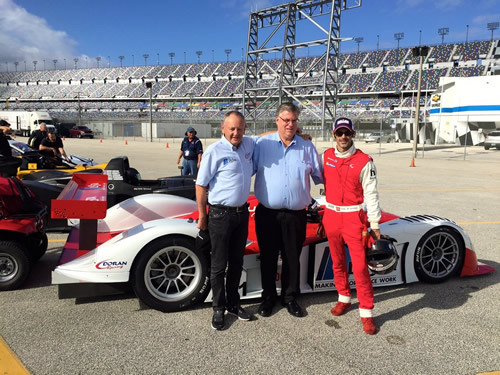 Left to right, Fredy Lienhard Sr., team owner Kevin Doran, Fredy Alexander Lienhard Jr. at Daytona last weekend. 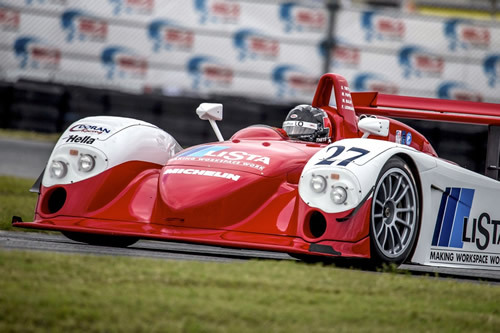 DAYTONA BEACH, Fla., Nov. 13 — The famous Doran-Lista Dallara Judd was an exciting addition to Historic Sportscar Racing (HSR)’s Classic 24 Hour at Daytona presented by IMSA on Saturday and Sunday at Daytona International Raceway both artistically and competitively. The beautiful red and white 2000-model Prototype No. 271 driven by Didier Theys and the father and son duo of Fredy Lienhard and Fredy Alexander Lienhard Jr. ended up fourth overall in the D class and second in the D-1 subcategory after four 45-minute races on Daytona’s 3.56-mile road course. Their total time was 2:50.05.187, just 1.83.398 off the winning time set by Florent Moulin’s ’01 Oreca-Dallara SP1, which completed 89 laps to their 86 in the 19-car field. In the process the No. 271 led 16 laps, was never off the podium in the D-1 subclass, and unofficially set the fastest lap of any car in several races. The Dallara Judd is the sister car to the one that Fredy Lienhard, Theys, Mauro Baldi and Max Papis drove to the overall victory in the 2002 Rolex 24 at Daytona, and helped the team win the championship that season. The team’s four races in the Classic 24 started at 4 p.m. and 10 p.m. Saturday and 4 a.m. and 10 a.m. Sunday. Each had a mandatory 3-minute pit stop. The team lost valuable time to work on the car’s set-up during practice because it had to sort out an issue with the car’s gearbox. Still, the crew persevered and constantly made the car better during the races, improving its finishes in each one in the process. Fredy Lienhard Sr. started tenth in the first race on Saturday, but was eighth overall by lap three and seventh by lap six out of 17 cars in the event. His son took over after the mandatory pit stop and advanced to sixth, but had to stop again when a light on the car went out. Still, the entry finished seventh in class and third in D-1 at the checkered, sandwiched between the second- and fourth-place D-1 cars. Theys started sixth overall and second in D-1 in Saturday night’s race and got right to work, vaulting up to third overall by the end of the first lap and taking second overall on lap two. He ran in second place through lap nine and was more than 7 seconds ahead of third place when he pitted both for the mandatory pit stop and because he thought he had a flat tire, which dropped him to ninth in the process. Fredy Lienhard Jr. took over at that point, and spun once to avoid two cars that were crashing near him but still finished sixth overall. Sunday’s results were even more impressive. Fredy Lienhard Sr. started sixth overall and third in D-1 in the 4 a.m. race. He passed the Willis Woerheide/Craig Bennett Lola on lap three for fifth overall and second in D-1, but that car passed him back on lap eight right before he made the mandatory pit stop, which dropped the car back to 12th overall on lap 10. There was a lot of action on lap 12, though, as Theys advanced from 12th to fourth overall and second in D-1 by a combination of passes and pit stops by some of his rivals. He was consistently setting faster lap times too, and established the fastest lap of the race on lap 19 with a 1:42.953. He moved into third overall on lap 22 by passing the John McKenna/Ross Thompson ’06 Riley & Scott MkII, and took the checkered in that position and second in D-1 on lap 23. Theys’ fastest race lap was 0.255 seconds faster than the fastest lap of the race winner, Moulin. The start of the final race on Sunday was a sight to behold, as Theys blasted from sixth overall to the overall lead and first in D-1 on the first lap. He set the fastest lap of anyone in the race on lap two with a 1:40.743, which was 1.729 seconds faster than the second-fastest lap of the race. He led 16 laps of the 23-lap race, only losing the lead when he made his mandatory pit stop on lap 17. He had a 16.765-second lead when he pulled into the pits to turn the car over to Fredy Lienhard Jr. The latter suffered a punctured tire on the last lap in NASCAR Turn 2 so he had a slow trip back to the pits, but he still finished fourth overall and second in D-1. For more information see hsrrace.com/events, hsrtickets.com, HSRRace.com, Classic24Hour.com, HSR’s YouTube channel and the series’ Facebook, Twitter and Instagram pages. Fredy Alexander Lienhard Jr.:“We had quite an emotional rollercoaster this weekend. During my first drive on Wednesday’s practice session, a problem developed. The gears didn´t want to change properly; the gears kept popping out, the engine went into the limiter. It just didn´t feel right and we aborted testing after we experienced those problems. “During the next two test days the team tried to fix it and they worked so hard on the car, for hours. They basically changed everything. But it just wouldn´t get any better, until we decided to put the car back to its original state with the manual gear change. This is actually how we drove the car 15 years ago. That was Saturday morning. It worked just perfect, but with no practice and no qualification time, we started from behind. “Dad did the start and worked his way through the field up to seventh place, and he handed the car over to me. The driver change and pit stop were spot on and I was on my way shortly after. My first stint was great; I had no mistakes and was able to maintain seventh place and even progressed to sixth. I was keeping the speed of the leader. The car was great and I enjoyed it a lot! “The second race started at 10 p.m., and Didier started. He drove the car to second place and then he thought he had a puncture just in front of the pit exit. I think it was on lap 7 or 8, so unfortunately, I was not ready to jump into the cockpit right away. I manage to put my gear on just in time but it was a hassle and I forgot my HANS device and my belts were not correct. This caused a lot of helmet lift at high speed and somehow, the entire stint was out of balance. I tried to catch up and in traffic I had to avoid two other cars crashing and I spun out. I didn´t touch anything but I had to pit just for safety reasons. After that I did some good, consistent and fast laps, but only got up to P6. “I did not take part in Race 3 at 4 a.m.; Dad and Didier shared the car. I was sleeping in the RV. They managed a perfect stint and got back to third place! “The last stint at 10 a.m. was shared between Didier and me. Everything was perfect; Didier started and gave the car over to me in P1! I held the position and did good and fast laps until the rear right tire blew up. This time it happened in the middle of the banking at more than 160 miles per hour. I´m actually happy that nothing worse happened. I got the car under control and limped back to the pits. Of course we lost all the good positions and we ended up in P4 at the end. It was a shame. For more information on Doran Racing, see DoranRacing.com. The team also has a Facebook page.